If there's any downside to the $25 Bacon Watch, it's that users may unintentionally gnaw at their own arm. 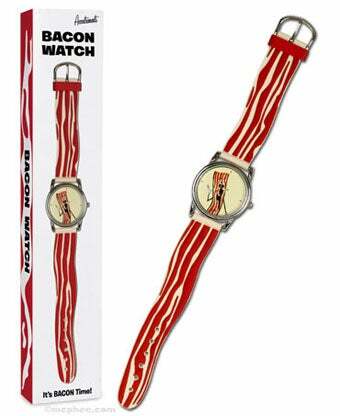 The Bacon Watch is actually a pretty typical timepiece save for its trademark bacon strips strap constructed of durable vinyl that promise to fit "most" adult wrists (the product is intended for bacon addicts, after all, so that's probably a reasonable disclaimer). I'm also quite keen on that little bacon mascot adorning the watch's face.